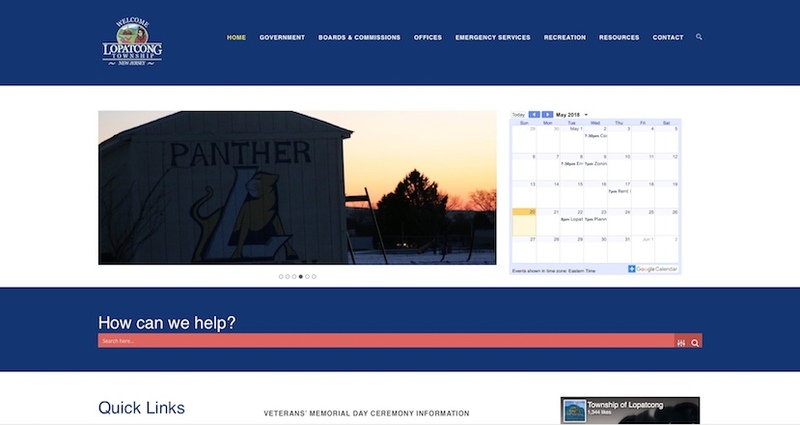 Citing ease of use, lower maintenance costs, and increased flexibility, the Township of Lopatcong (Warren County, NJ), retained Digital Strategy Associates LLC to transition their website to WordPress. The previous website, which was powered by Joomla, was difficult for staff to update and required the specialized services of a web developer to manage. The conversion to WordPress provided an opportunity to evaluate feedback from community members, and several enhancements were included in the new website including an event calendar, dynamic search bar, and social media integration. Our web designer’s collaborated with the township’s existing IT Consultant to transition several hundred documents to the new hosting environment. Digital Strategy Associates collaborated with township stakeholders to identify, develop, and implement a website design strategy that addresses their existing needs and future goals. The newly designed, responsive website, looks great across all devices and computers, including tablets and smartphones. With an easy to use content management system, township staff can post news and announcements.